A former off-road racer, a Swedish physicist and three tweeting astronauts form just part of the eclectic crew poised to blast off Tuesday aboard NASA's space shuttle Discovery. Discovery's six-man, one-woman crew is slated to launch on a 13-day mission to the International Space Station, where they astronauts will deliver vital supplies and experiments, as well as a new crewmember for the orbiting laboratory. "This is a great crew," said Discovery commander Rick Sturckow in a NASA interview. "I think from the very beginning we got off to a good start and we've maintained a good pace throughout the training ... and still manage to have fun together doing it, so I've really enjoyed training with this crew." Sturckow, 48, is no stranger to spaceflight or moving fast. A Marine Corps colonel, he's making his fourth trip to space with Discovery's flight, but got his start as a truck mechanic at age 16 and later raced off-road vehicles in Baja California while attending college. "There are so many similarities between spaceflight and trying to set up a mission, and building and operating a race vehicle," Sturckow said in a recent interview. "So many good lessons learned in project management and leadership." Sturckow joined NASA's astronaut corps in 1994, and flew combat missions in Operation Desert Storm before becoming a test pilot and spaceflyer. He is from Lakeside, Calif., and has two children - a 6-year-old son and an 8-year-old daughter - with his wife Michele. Sitting in the pilot seat for Discovery's flight is rookie astronaut Kevin Ford, a retired Air Force colonel and test pilot who moonlights as the drummer in the all-astronaut band Max Q. "There's a gig here in a couple of weeks and as you can imagine, I'm not going to be able to make it," said Ford, 49, in a recent interview. A fellow NASA astronaut will play in his place. "It's a lot of fun. Our one regret is we don't get a chance to practice as much as we'd want because at any one time about half the astronauts are gone in Russia or Japan or Florida or something...or space." A test pilot and engineer, Ford grew up on a farm in Montpelier, Ind., and joined NASA's astronaut corps in 2000. After nine years waiting for a flight, he said he's eager to feel the thrill of liftoff. Ford is married to wife Kelly and has two grown children. Discovery's Mission Specialist 1 is veteran astronaut Patrick Forrester, a retired Army colonel making his third spaceflight with the upcoming mission. But despite his experience, some folks confuse him fellow Army astronaut Tim Kopra (currently making his first flight at the space station). "People confuse us a lot, because we look alike," Forrester, 52, said with a laugh. "So it's going to be a lot of fun to be with Tim on orbit." Forrester will choreograph the three spacewalks of Discovery's mission and fly the shuttle's robotic arm. He is from Springfield, Va., and initially joined NASA as an engineer before being selected as an astronaut in 1996. Forrester is married to wife Diana and has two grown sons, one of whom recently shipped off to Afghanistan as a Black Hawk pilot. Flying in space has been a lifelong dream for astronaut Jose Hernandez, Discovery's Mission Specialist 2, since he was 9 years old. That was when he held the antenna rabbit ears of his family's television to get the clearest picture of the Apollo astronauts walking on the moon. "Now I kid around with my siblings that it's through osmosis that I got to be an astronaut," Hernandez, 47, told reporters in a recent briefing. "I think that was the pivotal point when I decided to become an astronaut." Hernandez spoke only Spanish until he was 12 years old, when he learned English. He grew up in a migrant farming family and picked vegetables and fruits in California when he wasn't in school. A second grade teacher persuaded his parents to settle in Stockton, Calif., for the sake of their children's education. He was inspired in high school by NASA's first Hispanic astronaut Franklin Chang-Diaz. He earned a bachelor's degree in electrical engineering from the University of the Pacific and later a master's degree in electrical and computer engineering from the University of California at Santa Barbara. He joined NASA as a research engineer 2001 and became an astronaut in 2004 after applying for 12 straight years. Hernandez will serve as Discovery's flight engineer for launch and landing, and will wield robotic arms on the shuttle and space station. He is also NASA's first astronaut post bilingual updates to the microblogging Web site Twitter. He is chronicling the mission under the name: @Astro_Jose. "I'm very excited about the flight," Hernandez said. "I feel like we've been studying for a final exam and we're at the point where we're finally ready." Hernandez is married to wife Adela, who runs a restaurant nearby NASA's Johnson Space Center in Houston called Tierra Luna Grill, which is Spanish for Earth Moon Grill. They have three daughters, ages 10, 12 and 13, and two sons, ages 6 and 15. Visit SPACE.com Sunday for an in-depth look into Hernandez's path to space. Leading the three spacewalks for Discovery's mission is veteran astronaut Danny Olivas, Mission Specialist 3, who is making his second shuttle flight. 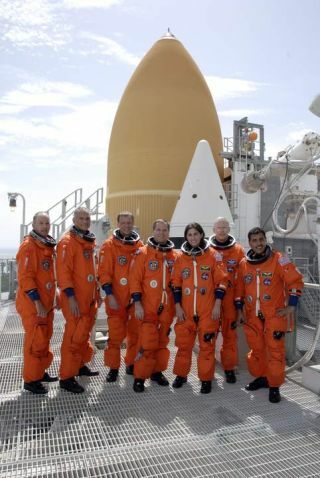 During his first flight, which was also with Sturckow and Forrester in 2007, Olivas performed surgery on a shuttle insulation blanket to staple and sew it down, making sure it was secure. On this flight, he'll watch over the installation of new science experiments, vital space station maintenance and one big chore - replacing a huge tank of ammonia coolant that is as massive as a small car. "The biggest challenge to a spacewalker is not what we know, it's what we don't know" Olivas, 43, said in an interview. He said he's looking forward to helping Discovery's rookie spaceflyers find their space legs for the first time. Olivas grew up in El Paso, Texas, and has a doctorate in mechanical engineering. He joined NASA's astronaut ranks in 1998. He and wife Marie have five children; two daughters ages 6 and 14, and three sons ages 8, 10 and 12. Swedish physicist Christer Fuglesang, Discovery's Mission Specialist 4, is the only Swede to fly in space and is carrying his country's pride with him as he makes his second spaceflight. He has a doctorate in engineering particle physics and is former Swedish Frisbee national champion. "I'm very happy that people are following the space program in Sweden and very happy to be their connection," said Fuglesang, 52, who represents Sweden and the European Space Agency on Discovery's crew. He is a veteran spacewalker who will participate in two of the mission's spacewalks. Fuglesang has been writing an online newsletter about his mission to reach out to the Swedish public and is also posting updates on Twitter in Swedish and English. He is tweeting under the name: @CFuglesang. On his first spaceflight, Fuglesang set a new record for the longest Frisbee toss (20 seconds) but he's leaving his beloved discs at home for this mission and plans to play chess against the Swedish public instead. Fuglesang is from Stockholm, Sweden, and joined Europe's cadre of astronauts in 1992. He and wife Elisabeth have two grown daughters and a 14-year-old son. Rounding out Discovery's crew is first-time spaceflyer Nicole Stott, who will replace NASA astronaut Tim Kopra as a member of the station's six-person crew. Kopra will return to Earth after more than a month in space when Discovery lands on Sept. 6. Stott, 46, is not the first woman to join a space station crew, but she will make history of a sort as the first mother to take up long-term residence aboard the space station. She and her husband have a 7-year-old son. "For me and my family, regardless of whether I the first mother up there or not, we have come up with our ways of keeping everyone engaged and wanting to go on with the mission," Stott told SPACE.com. Stott plans to spend at least three months living and working aboard the station as part of its Expedition 20 and 21 crews. She will participate in one of the three spacewalks for Discovery's crew and is due return home on NASA's next shuttle mission in November. Stott grew up in Clearwater, Fla., and originally joined NASA as a shuttle operations engineer in 1988 before being selected as an astronaut in 2000. Once she arrives at the space station, Stott will begin using Twitter to update the public under the name @Astro_Nicole. She is also writing about her mission on a NASA blog: http://blogs.nasa.gov/cm/blog/1831. SPACE.com will provide complete coverage of Discovery's STS-128 mission to the International Space Station with Managing Editor Tariq Malik and Staff Writer Clara Moskowitz. Click here for shuttle mission updates and a link to NASA TV.